Two Birds from the Same Egg with Poetry PLUS! We are pressed for time, so we mul­ti­task. You might be eat­ing break­fast while you’re read­ing Bookol­o­gy, or doing laun­dry, or both. “Killing two birds with one stone” or “hatch­ing two birds from the same egg”—integrated teaching—is the best way to fit every­thing in, espe­cial­ly in the K-5 class­room. In anoth­er post here at Bookol­o­gy, Melis­sa Stew­art talked about “facts-plus” books that present facts and explain them. 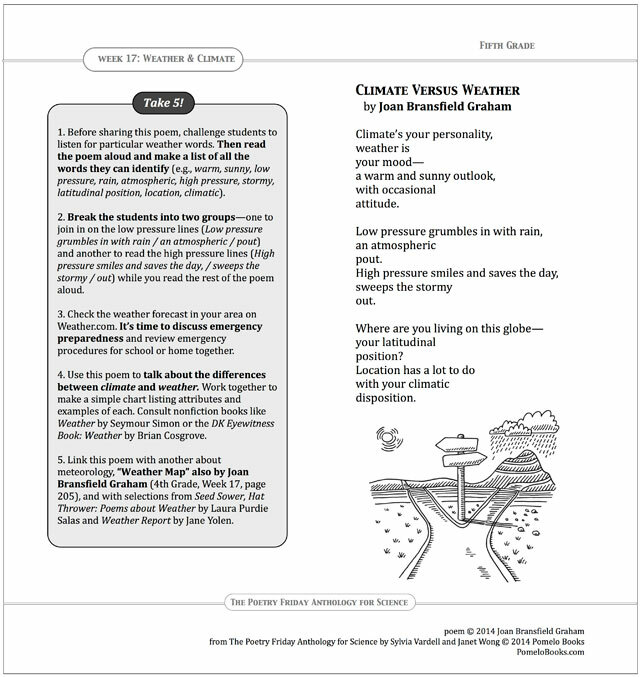 We’d like to sug­gest that our books in The Poet­ry Fri­day Anthol­o­gy series are “Poet­ry PLUS”; we present poems that tie into the Com­mon Core State Stan­dards (CCSS), Next Gen­er­a­tion Sci­ence Stan­dards (NGSS), social stud­ies stan­dards, and state stan­dards such as the Texas TEKS—and we show you how to teach these poems, too. For exam­ple, here’s one of the 218 poems in The Poet­ry Fri­day Anthol­o­gy for Sci­ence (K-5 Teacher Edi­tion), with its accom­pa­ny­ing “Take 5!” mini-les­son. 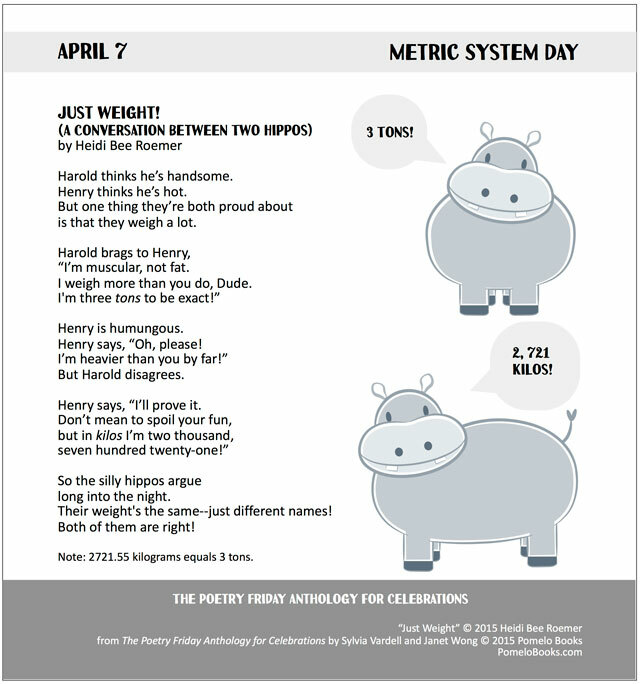 The NGSS and most state stan­dards for sci­ence require ele­men­tary stu­dents to under­stand weath­er and cli­mate and be able to dis­tin­guish between the two—something that this poem teach­es in a way that will appeal to poet­ry lovers (who are hes­i­tant about sci­ence) and also to bud­ding sci­en­tists (who are unsure of poet­ry). We hope that our books—and the Take 5! approach to shar­ing any poem—will help teach­ers find more time to share poet­ry, this month and all year long! 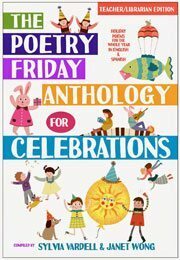 Sylvia Vardell and Janet Wong are the cre­ators of The Poet­ry Fri­day Anthol­o­gy series (Pome­lo Books) fea­tur­ing 700+ poems by 150+ poets, includ­ing: Jack Pre­lut­sky, Joyce Sid­man, J. Patrick Lewis, Nao­mi Shi­hab Nye, Mar­i­lyn Singer, Kenn Nes­bitt, Mary Ann Hober­man, Mar­gari­ta Engle, Joseph Bruchac, April Hal­prin Way­land, Jen Bryant, Lin­da Sue Park, Nik­ki Grimes, Vir­ginia Euw­er Wolff, and more. To learn more about their work please vis­it Sylvia’s blog and Janet’s web­site.